Quadrant is an Australian literary and cultural journal. Quadrant reviews literature, as well as featuring essays on ideas and topics such as politics, history, universities, and the arts. It also publishes poetry and short stories. The magazine was founded in Sydney in 1956 by Richard Krygier, a Polish–Jewish refugee who had been active in social-democrat politics in Europe and James McAuley, a Catholic poet, known for the anti-modernist Ern Malley hoax. It was originally an initiative of the Australian Committee for Cultural Freedom, the Australian arm of the Congress for Cultural Freedom, an anti-communist advocacy group funded by the CIA. It has had many notable contributors including Les Murray, who was its literary editor from 1990 to 2019,:240 Peter Ryan, who wrote a column from 1994 to 2015, Heinz Arndt, Sir Garfield Barwick, Frank Brennan, Ian Callinan, Hal Colebatch, Peter Coleman, Sir Zelman Cowen, Anthony Daniels, Joe Dolce, David Flint, Lord Harris of High Cross, Paul Hasluck, Dyson Heydon, Sidney Hook, A. D. Hope, Barry Humphries, Clive James, John Kerr, Michael Kirby, Frank Knopfelmacher, Peter Kocan, Christopher Koch, Andrew Lansdown, John Latham, Douglas Murray, Patrick O'Brien, Sharon Olds, George Pell, Pierre Ryckmans, Roger Sandall, Roger Scruton, Greg Sheridan, James Spigelman, Sir Ninian Stephen and Tom Switzer, as well as several Labor and Liberal political figures, including Bob Hawke, John Howard, Tony Abbott, Mark Latham and John Wheeldon. In the immediate aftermath of the 2017 Manchester Arena bombing Quadrant's online editor Roger Franklin wrote an article titled "The Manchester Bomber's ABC Pals" Referring to the Manchester bombing and Monday night's Q&A television program, the article said, "Had there been a shred of justice, that blast would have detonated in an Ultimo TV studio" (it was later amended to, "What if that blast had detonated in an Ultimo TV studio?") and then continued, "Unlike those young girls in Manchester, their lives snuffed out before they could begin, none of the panel’s likely casualties would have represented the slightest reduction in humanity’s intelligence, decency, empathy or honesty." ABC Managing Director Michelle Guthrie called the article a "vicious and offensive attack" and called for the article to "be removed and apologised for". Quadrant editor-in-chief Keith Windschuttle eventually acknowledged that the article was "intemperate" and "a serious error of judgment", and he apologised for the offence it had caused. The article was removed from the Quadrant website on 25 May 2017. The magazine holds a conservative stance on political and social issues. "the intrinsic value of cultural and intellectual freedom and of inquiry..."
"cultural and intellectual freedoms, indeed negative liberties generally, depend upon an abundance of autonomous institutions and an open society..."
"political democracy... support of particular democratic institutions, and a culture that accepts peaceful and democratic modes of government and change of government..."
"liberal democracy, that is democracy that respects individual liberty... insists that government be limited: by other holders of political and economic resources, by legally protected private property, by free media, and most of all by the rule of law, that is the restraint and channelling of power by law..."
"the virtues, and commonly the wisdom, borne by traditions in social and moral life... It has not pretended that traditions have all the answers or should be treated with uncritical reverence... It has, however, recommended that... long established moral and social practices be treated with respect and caution." "an economic order in which markets are allowed to work - within the rule of law (and the framework of property rights) - as sources of information, as ingredients and supporters of liberty and as facilitators of competitive private enterprise and individual choice..."
In March 2008, the magazine was describing itself as sceptical of "unthinking Leftism, or political correctness, and its 'smelly little orthodoxies'". ^ "Australian Magazines of the Twentieth Century". Austlit. Retrieved 1 January 2012. ^ Laurie Clancy (2004). Culture and Customs of Australia. Greenwood Publishing Group. p. 125. ISBN 978-0-313-32169-6. Retrieved 30 April 2016. ^ a b c "About Us". Quadrant. Quadrant Magazine Ltd.
^ "Quadrant apologises to ABC boss over 'vicious' bombing article". ABC News. 24 May 2017. Retrieved 24 May 2017. ^ O'Malley, Nick (24 May 2017). "Quadrant editor issues 'unreserved' apology to the ABC over 'sick and unhinged' Manchester blast article". The Sydney Morning Herald. Retrieved 24 May 2017. ^ Dame Leonie Kramer, "The Values of Quadrant", in:Quadrant, No. 290, Vol. XXXVI, No. 10, October 1992, p. 2. ^ "Australian literary magazines". Department of Culture and Recreation. Commonwealth of Australia. Archived from the original on 8 December 2010. Retrieved 2 January 2011. ^ Cubby, Ben (24 October 2007). "Windschuttle to edit Quadrant". The Sydney Morning Herald. Fairfax Media. Retrieved 15 June 2008. ^ a b c "Notes from the editor", Quadrant, March 2017, p. 4. ^ "Barry Spurr appointed Quadrant's new Literary Editor", Quadrant, March 2019, p. 3. Quadrant's 50th anniversary - ABC Radio National Counterpoint 2006 feature interview with Martin Krygier (former Quadrant Director and son of founder), Dame Leonie Kramer AC DBE (former Quadrant Chair), and Paddy McGuinness: transcript located here. The New Republic is an American magazine of commentary on politics and the arts, published since 1914, with influence on American political and cultural thinking. Founded in 1914 by leaders of the progressive movement, it attempted to find a balance between a humanitarian progressivism and an intellectual scientism, and ultimately discarded the latter. Through the 1980s and '90s, the magazine incorporated elements of "Third Way" neoliberalism and conservatism. Ernest Lalor "Ern" Malley was a fictitious poet and the central figure in Australia's most famous literary hoax. He and his entire body of work were created in one day in 1943 by conservative writers James McAuley and Harold Stewart in order to hoax Max Harris and his modernist magazine Angry Penguins, which Harris co-edited with John Reed of Heide, Melbourne. Partisan Review (PR) was a small circulation quarterly "little magazine" dealing with literature, politics, and cultural commentary published in New York City. The magazine was launched in 1934 by the Communist Party, USA-affiliated John Reed Club of New York and was initially part of the Communist political orbit. Growing disaffection on the part of PR's primary editors began to make itself felt, however, and the magazine abruptly suspended publication in the fall of 1936. When the magazine reemerged late in 1937, it came with additional editors and new writers who advanced a political line deeply critical of Stalin's USSR. 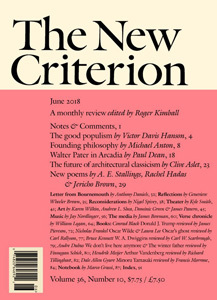 The New Criterion is a New York-based monthly literary magazine and journal of artistic and cultural criticism, edited by Roger Kimball and James Panero. It has sections for criticism of poetry, theater, art, music, the media, and books. It was founded in 1982 by Hilton Kramer, former art critic for The New York Times, and Samuel Lipman, a pianist and music critic. The name is a reference to The Criterion, a British literary magazine edited by T. S. Eliot from 1922 to 1939. Robert Michael Manne is an Emeritus Professor of politics and Vice-Chancellor's Fellow at La Trobe University, Melbourne, Australia. He is a leading Australian public intellectual. John O'Sullivan, CBE is a British conservative political commentator and journalist. During the 1980s, he was a senior policywriter and speechwriter in 10 Downing Street for Margaret Thatcher when she was British prime minister and remained close to her up to her death. O'Sullivan served from 2008–2012 as vice-president and executive editor of Radio Free Europe/Radio Liberty. He is currently president of the Danube Institute and editor of the Australian monthly magazine Quadrant. He is also a member of the board of advisors for the Global Panel Foundation, an NGO that works behind the scenes in crisis areas around the world. Roger Kimball is an American art critic and social commentator. He is the editor and publisher of The New Criterion and the publisher of Encounter Books. Kimball first gained prominence in the early 1990s with the publication of his book Tenured Radicals: How Politics Has Corrupted Higher Education. He currently serves on the board of the conservative Manhattan Institute, and as a Visitor of Ralston College, a start-up liberal arts college based in Savannah, Georgia. He also served on the Board of Visitors of St. John's College and the board of Transaction Publishers. James Phillip McAuley was an Australian academic, poet, journalist, literary critic and a prominent convert to Roman Catholicism. Peter Coleman considered that "no one else in Australian letters has so effectively exposed or ridiculed modernist verse, leftie politics and mindless liberalism". Richard Connolly is an Australian musician, composer and former broadcaster for the Australian Broadcasting Corporation. Dame Leonie Judith Kramer, was an Australian academic, educator and professor. She is notable as the first female professor of English in Australia, first woman to chair the Australian Broadcasting Corporation and the first female chancellor of the University of Sydney. She was made a Dame Commander of the Order of the British Empire and a Companion of the Order of Australia. William Peter Coleman was an Australian writer and politician. A widely published journalist for over 60 years, he was editor of The Bulletin (1964–1967) and of Quadrant for 20 years, and published 16 books on political, biographical and cultural subjects. While still working as an editor and journalist he had a short but distinguished political career as a Member of the New South Wales Legislative Assembly from 1968–1978 for the Liberal Party, serving both as a Minister in the State Cabinet and in the final year as Leader of the New South Wales Opposition. From 1981–1987 he was the member for Wentworth in the Australian House of Representatives.